Famous wine company headquartered in the community Meursault in the Burgundian area Côte d'Or, The Négociant house Maison Leroy was founded in 1868 by François Leroy (? -1870) in the municipality of Auxey-ut Duresses. He also had business relations with the brandy producer Hugo Asbach (1868-1935). His grandson Henri Leroy (1894-?) Extended the ownership of his own winery. In the 1930s he became a customer of Domaine de la Romanée-Conti and later friend of co-owner Edmond Gaudin de Villaine. When the winery came in financial difficulties in the early 1940s, Henri Leroy bought in 1942 the share of Jacques Chambon and became the second director in 1950. In addition, he retained his trading house Leroy SA , which took over the exclusive distribution of DRC wines. Daughter Lalou Bize-Leroy took over the DCRC management together with Aubert de Villaine (* 1939). In 1988, Lalou bought around 65 million francs the run-down winery of Charles Noëllat and the Domaine Philippe Remy. For financing, a third of the stake of the trading house Leroy SA was sold. The engagement in two wineries was charged to her as a conflict of interest. This and other longstanding disputes broke the business relationship in 1992. 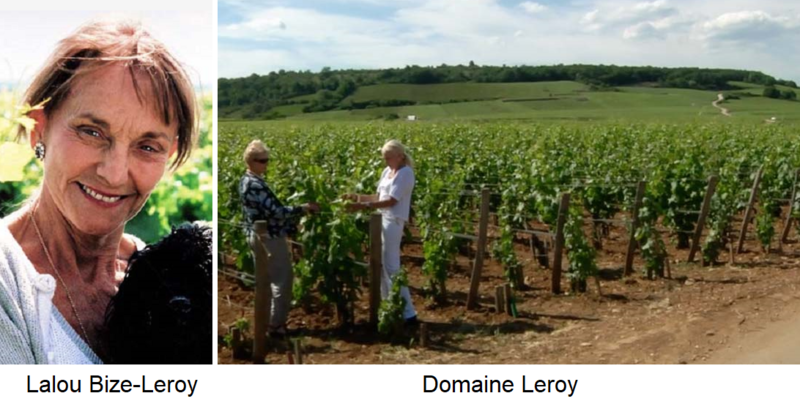 Lalou Bize-Leroy retired from the DRC and dedicated himself to the new estate Domaine Leroy . The vineyards now cover 22.5 hectares of vineyards in the famous Burgundian communities Aloxe-Corton. Chambolle-Musigny. Gevrey-Chambertin. Morey-Saint-Denis. Pommard. Savigny-lès-Beaune. Vosne-Romanée and Vougeot, These are the Grands Crus Chambertin, Clos de la Roche, Corton-Charlemagne (white), Clos de Vougeot, Corton-Renardes, Latricières-Chambertin, Musigny. Richebourg and Romanée-Saint-Vivant, as well as many Premiers Crus. Since the beginning of the 1990s, Madame Bize-Leroy has been an uncompromising representative of the Biodynamic viticulture, She was inspired by a visit to the famous winemaker Nicolas Joly at his winery Château de la Roche-aux-Moines (Loire), the uncompromising biodynamic farmed. She then suddenly shut down her business within a short time. This means, among other things, the avoidance of chemical agents for the fertilization and pest control as well as the consistent attention of the moon phases for all work in the vineyard. Yields are kept extremely low by rigorous pruning with a maximum of 20 hl / ha. In many plots the vines are between 50 and 80 years old. This results in wines of outstanding quality in often the smallest quantities of only two to three barrels. Most of them mature for 18 months in new oak barrels, but due to the very high natural concentration, this does not lead to an overemphasis on the oak flavor. There is usually no before bottling beautiful and no filtration, These vintages count due to the elaborate vinification to the most expensive wines in the world, The wines of the family estate Domaine d'Auvenay with vineyards in the Grands Crus Bonnes Mares, Chevalier-Montrachet and Mazis-Chambertin are vinified under this label.